IF YOU SUBSCRIBE NOW, YOUR FIRST MONTH WILL BE MARCH AND YOU WILL RECEIVE A RAINBOW COZY TO START YOUR YEAR LONG CALENDAR OF COZIES! 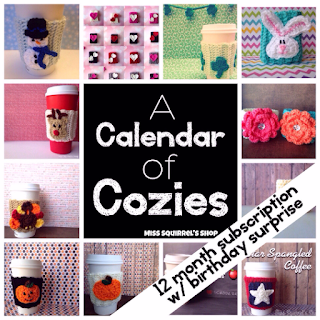 Thank you for your interest in A Calendar of Cozies subscription! This option allows you to pay $12.00 a month for 12 months! (Thanks, PayPal!) I am only setting up the 12 month subscription with the birthday surprise for monthly installments. If you wish to pay in full for the 12 month or 6 month subscription, you can do that in my Etsy shop. Those links are at the bottom of this page. The ETSY listings will always be available, but for tracking and shipping purposes, I am only going to have the this link for monthly payments available for a limited number of subscribers each month. If you miss the sign up, watch for the announcement at the beginning of the next month on Instagram. Sign up for the newsletter to get all updates here!!! Below you will see the information from the listing in my Etsy shop. Many of my customers have asked me in the past if I would consider creating a listing that would be a year's worth of cozies- well, I finally have! AND THIS IS IT!!! With the purchase of A Calendar of Cozies subscription, get you one themed cozy EVERY MONTH that relates to the season or holiday in that month. Your year will start with your purchase, so it doesn't matter what time of the year you start, by the time a year passes, you will have one cozy for every month! And shipping is included in this price! In addition to the 12 themed cozies, I will also send you a special birthday surprise in your birthday month! By subscribing, you are saving $45! These 12 cozies and the birthday surprise purchased separately (with shipping) would cost $175. As a subscriber, you will also receive 10% off of every order you make during the year of your subscription. So if you order additional cozies for your friends or different ones for yourself, you will always save! The code for this additional savings will be sent to you after your purchase. ***Each month you will receive a cozy like the ones pictured. It may vary slightly in shade. As the year progresses, I may add a new cozy to the shop. For instance, I am considering a leprechaun hat, a rainbow/cloud, or even a cute little lamb for March instead of the shamrock that is pictured. But you can rest assured that if there are any changes, they will always be just as adorable and it will fit the theme of that month! *** Please be certain that the mailing address that is in PayPal is correct. That is the only address that will show up for me in your original order. So if you move you will need to contact me so that I can change it for my records. If you are purchasing this as a gift for someone, be certain you have their correct address. Since this is a totally new aspect of the shop, I am only opening up a limited amount of spots to start out with. As I add more, I will make announcements in the shop's newsletter. So go ahead and use the button below to set yourself up to receive some SQUIRREL MAIL each and EVERY month for one whole year! !